The PHP Classes site is now launching a new feature that will make your participation in the site more fun and rewarding. It is a new system of missions and levels that you can engage and gain more feedback and recognition for your participation in the site as PHP developer. Read this article and watch the included demonstration video to learn how it works and start enjoying now. What is a PHP Master? You may be a very experienced PHP developer, you may work hard, develop great PHP components and share them with the world as Open Source. However, if you do not get good visibility for your work, you will hardly be recognized as a PHP Master that you are. The PHP Classes site was created in 1999 precisely with that goal: provide means for you to get greater visibility for your work, as well feedback and recognition for the valuable PHP components that you can share in the site. Being a PHP Master is one thing. Be seen as a PHP Master requires an harder effort. The PHP Classes site is here to help you on that quest. Today the site is launching a new system of missions and levels that can help you get more feedback and recognition for the all the good classes that you share on the site. Each level is made of a group of missions. Each mission is a task that you need to accomplish on the site. Initially the missions are very simple and easy to achieve. As soon as you complete a level and move on to the next level, the tasks start becoming harder to achieve, so only those that prove they are the best will be able to level up. The site rewards class authors that complete each level with very beautiful badges that are personalized with your name. The quality of the materials used in the badges will also increase to reflect the meaning and the value of your achievements. Here is a nice sample of the initial level badge. It is made of wood because it is the apprentice level. As you move on, badges use more prestigious materials. The initial missions are mainly to get you acquainted with the system and update your profile, so you can get greater exposure in the PHP Classes site, as well in social networks and search engine results. Then the really challenging missions start. I am not going to disclose more details of the missions and levels you can complete just to not spoil the surprise and eventual pleasure you will have discovering everything. The only thing I can tell you is that many months of dedicated effort were put in this initiative. Many beta testers helped finding issues and suggesting improvements. I hope you really have fun participating in this initiative. Meanwhile watch this short demonstration video to see how it works in practice so you can get started quickly. The starting page for participating in this initiative is the user status page. Just go there so you can see your progress and be briefed about the next missions. As you may have noticed, the title of this article mentions Part 1. If this is Part 1, you may be wondering what will be the following parts to become a PHP master? As a matter of fact, this is just one part of bigger plan to make the PHP Classes site more fun and rewarding for those to participate in it. Many things are planned for the future, but I hope you can excuse me for not disclosing much more than this for now. What I can tell you is that so far the site focused mainly in promoting the work of those that share their best classes. Those represented only 0.3% of all the site users. It is time to move on and provide recognition for other types of PHP masters. You do not need to write great PHP classes to be a PHP master. You can be a PHP master in many ways. In the future other types of PHP mastery will be promoted and recognized. 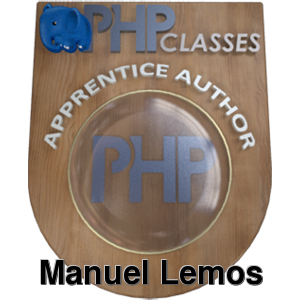 First I would like to thank the company that worked together with the PHP Classes site to provide such beautiful badges. I did not want PHP Classes to be yet another site giving stinking badges. This company was able to capture the idea for the badges and provided a solution that resulted in badges that not only are beautiful, but they are full of meaning. It's PHP all over, but more important than that, the name of the author that gets a badge is drawn on the badge. The original plan was more ambitious than this but it required more time and research to produce satisfactory results. Again excuse me for not disclosing what was the original plan, but I can tell you that I will get back to it soon. So expect interesting news about this on the next iteration. Finally, I also would like to thank many beta testers that volunteered to spend time evaluating the developments, reported bugs and made awesome suggestions, some of which were already implemented. For those that are interested in becoming beta testers, stay tuned. Invitations will be sent to those that engage on the current series of missions and levels. This initiative will also be started in the JS Classes site soon. It is just a matter updating the badges for that site. A post will be submitted in the JS Classes site blog post soon once this initiative is started there, so you can get involved there too. For now, feel free to comment, present criticisms, report issues, send your improvement suggestions by posting a comment to this post.